This race also completes my 7th consecutive race in a row since Surf City in February. I wasn’t planning on doing so many races in such a short period of time, but it’s hard for me to turn down a race when I have friends running it and it’s local. Most of these races have been total impulse buys and very last minute (i.e. 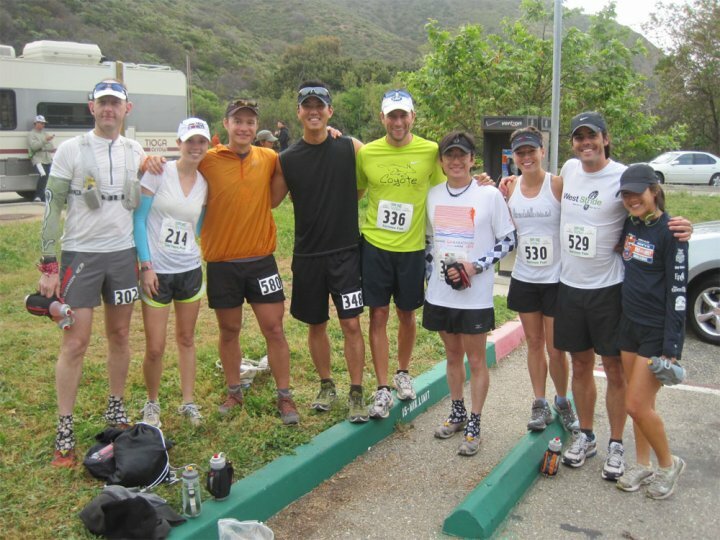 Napa marathon, Agoura, Sycamore). I briefly checked out the elevation map on the website the night before.. It was pretty much half up and half down with the turnaround at Mile 5.5. I had no time goal in mind, just wanted to have fun out there and enjoy the views. They weren’t kidding about the spectacular views once we got to the top, but they also weren’t kidding about the hills. Right from the beginning, we started climbing. It was single track for most of it and a bit congested in the beginning. There wasn’t really enough space to pass people, so if someone started to walk, everyone behind that person would also have to slow down. It was almost like a group hike in the beginning going up the mountainside, until my friend behind me told me to pass the person walking so we could continue on the trail path. The climb was pretty brutal and by the time I got to the top, my legs were already trashed. I eventually made my way to the top and saw Emil, Erin, Colin & Kristin during the downhill. It was great having such a small race and seeing a bunch of familiar faces along the course. The downhill was fairly steep and I haven’t yet mastered how to cruise gracefully down the mountain without doing a face plant into the trail. I’m pretty cautious going downhill because of all the uneven footing and rocks, but some people can fly down those things without a care in the world. A part of me was praying that the course back didn’t involve turning around and going back the same way we came. Once I saw runners coming towards me from the opposite direction, I knew we were turning around and climbing back up the same downhill. Damn, more hills. I reached the bottom of the mountain where the first and only aid station was at. Took off my long sleeve, chugged water from my handheld bottle and debated whether or not to continue on the trail to complete the 30K. I was getting tired already and knew I had the long climb back. I stuck with the 18K course and started back up the same hill. I saw some more friends (Ann, Lamia, Renee, Andrea, Emil) coming down as we exchanged words of encouragement. It was a pretty brutal climb back up, but I took it easy. I ran/shuffled most of it, but had to stop and take a couple walking breaks. I finished around 1:53, give or take. My Garmin was acting up in the middle of the race and since there aren’t any official results posted, the times are approximately. Apparently, I won first in my age division. Who knew? I only found this out through Twitter. I absolutely had no expectations for this race and never bother to check race results after. Guess I will be getting a medal for this race after all 🙂 They had great post-race fuel (candy, chili, chicken noodle soup, pretzels), but it was mainly for the longer distance races. I grabbed a Diet Coke and stayed around and chatted with some friends. It was getting super chilly so I decided to head back home. Sad that I didn’t see some of my other friends finish, but hey, that’s what blogs are for! It’s nice to read people’s war stories on the same trail the next day. Gotta love hills, no pain no gain! Good jod! oh man, I should’ve followed you and turned around at the aid station. But I love the La Jolla Valley loop and the only way to run it is if you run at least the 30k. Too bad my body wasn’t up for the distance. We should’ve swapped places because you looked strong out there! Great job Andee and congrats on the AG win! Nice to see ya again…it was a beautiful day, beautiful course.